Investors should look out for more information on aircraft pricing trends, Dreamliner production costs, and KC-46 development progress. Boeing (NYSE:BA) investors have been on a roller-coaster ride this year. Shares of the aerospace giant plunged 25% in the first six weeks of the year on fears of slowing order volume and a projected year-over-year decline in commercial airplane deliveries for 2016. Yet the stock has since reclaimed more than half of that lost ground. 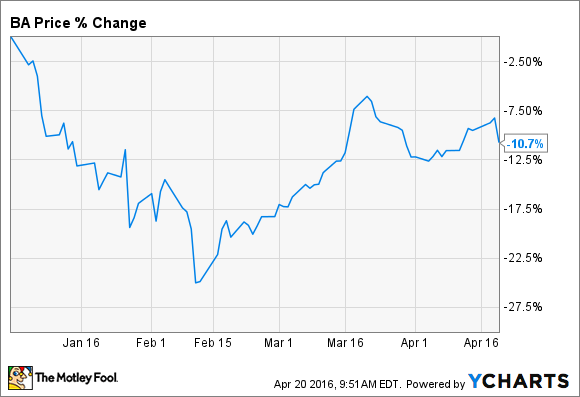 Boeing's Q1 earnings report next week will help determine what comes next for Boeing stock. We already know some of the key details. Boeing delivered 176 commercial jets last quarter and took in over 100 net orders -- both roughly in line with last year's Q1 numbers. Here's what investors should try to learn more about. How are airplane prices holding up? One area of potential concern for Boeing investors is aircraft pricing. It's no secret that Boeing has faced stiff price competition from Airbus (NASDAQOTH:EADSY) in recent years. Bombardier is also starting to compete on some deals for smaller mainline planes. In late March, Boeing announced that it would cut thousands of jobs this year in a bid to reduce its cost structure. Ray Conner, head of Boeing's commercial jet business, stated that cost cuts were needed because customers were demanding lower prices -- and threatening to buy from Airbus if Boeing didn't give in. Boeing faces growing pricing pressure in its commercial jet business. Image source: The Motley Fool. In another potentially ominous sign, Boeing reportedly sold dozens of 737s to United Continental for as little as $22 million each. That's probably below cost. These sales made up the bulk of Boeing's Q1 order activity, which raises questions about the strength of jet demand. Thus, investors should listen carefully to Boeing's earnings call for any management comments about how aircraft pricing is holding up in recent deals and ongoing negotiations. (Check back here next week for a full run-down of the conference call highlights.) Weak aircraft pricing could undermine Boeing's efforts to expand its commercial aircraft profit margin. Are Dreamliner production costs falling fast enough? Investors should also look for further signs of progress on reducing production costs for the 787 Dreamliner. While Boeing has reported paper profits on its Dreamliner sales so far, on a cash basis, production costs have outstripped revenue by tens of billions of dollars. Production costs have steadily declined as workers have become more efficient and Boeing's suppliers have reduced their prices. As a result, the 787 program finally turned cash positive in Q4 2015. The 787 program has just started to produce cash profits. Image source: The Motley Fool. However, Boeing has a long way to go to make up the nearly $29 billion in Dreamliner deferred production costs it held on its balance sheet at the end of 2015. With Airbus offering big discounts on A330neo and A350 jets, Boeing can't expect to make big profitability gains through better pricing. It will have to keep reducing costs. Can Boeing catch up on KC-46 development? Finally, investors should look for any potential hints about Boeing's prospects for keeping the KC-46 aerial refueling tanker on schedule -- and on budget. Boeing has already suffered costly delays on the KC-46 development program and has cut it very close in terms of proving the airplane's capabilities and delivering the first batch of tankers on time. Most recently, Boeing has encountered trouble when trying to refuel a C-17 transport plane from the KC-46. Boeing is responsible for any cost overruns, so if there isn't an easy fix, this could result in Boeing taking another special charge. Even if the problem can be resolved cheaply, it may delay the Air Force's decision to approve low-rate production. The KC-46 program could still turn out to be a big success. The initial Air Force contract is worth about $50 billion, and Boeing should have opportunities to sell more of the type to foreign militaries and for future Air Force tanker replacement needs. But first, it needs to get the KC-46 into service on-time without incurring any further cost overruns.